A woman has been reunited with her cat which went missing 10 years ago. Peanut escaped through a locked catflap a week after his owners moved to a new home in Watton, Norfolk, and completely disappeared - for a decade. But last week, the microchipped moggy was brought in to a charity in the area and identified as puss Peanut. Owner Julie Terry, who now lives in Cambridgeshire has finally taken him home after an emotional reunion where she described Peanut as a "miracle". She had given up all hope of finding her feline friend which had been owned by the family since 2006 when he was just a kitten. They had done their best to keep Peanut inside when they moved to Watton from their Ely home in 2009, but "Peanut was quite a butch cat and didn't like being inside, so he broke through the locked catflap", Miss Terry said. 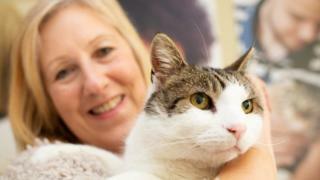 The moggy was missing for 10 years, until he was taken in to Cats Protection in Dereham. Image caption Ahead of the reunion, Miss Terry said they were "nervous and excited". Staff told Miss Terry an elderly man who lived close to her Watton home had befriended Peanut, and would feed him, although the cat had been "living almost as a stray". Ahead of the reunion, Miss Terry said they were "nervous and excited". "He let us pick him up and he was fine - he's still our baby, but we're not sure if he recognises us. "He seems like a very happy and contented cat - he's beautiful."